The Scientific Glassblowing Learning Center: What is Scientific Glassblowing? 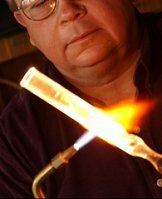 Home Page --> What is Scientific Glassblowing? What is it? Scientific Glassblowing is the process of creating glass apparatus and glass systems used in research and production. Where is it found? Scientific glassware is found in many government, educational and industrial laboratories. Chemical, medical, pharmaceutical and engineering laboratories use scientific glassware extensively, and almost all areas of scientific research will use glass at some time. Who does it? Scientific Glassblowers. These valuable allies in contemporary research are highly skilled artisans who form the glass into the shapes and dimensions called for by the scientific investigator. The glassblower usually has a strong background and understanding of the sciences. It takes many years of experience in a multidisciplinary environment to develop the professional scientific glassblower. How is it done? Using a torch or burner, scientific glassblowers heat, form and seal glass tubing, rod and pre-formed components into glass apparatus such as the high-vacuum manifold you see to the right. Occasionally you will still hear of this style of glassblowing referred to as lampworking. See our Basic Scientific Glassblowing Tutorial for more information. How does this differ from other glassblowing? You may have seen glassblowers take glowing globs of molten glass out of a furnace and turn them into pitchers, vases, paperweights and other vessels or art objects by blowing on a long tube and working the glass. These artisans use a wide variety of glasses and make most of their pieces from molten glass and raw materials. 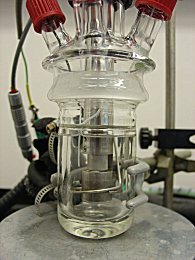 In contrast, scientific glassblowers generally start with existing glass parts and use the same basic techniques to create laboratory apparatus. Scientific glassblowers generally only work with borosilicate glass and quartz, both of which have higher working temperatures than art (or "soft") glass and have desirable physical properties for laboratory applications. But all types of glassblowers are artisans at heart! 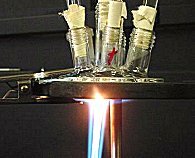 This image shows a glass multi-port flange top being preheated prior to repair. 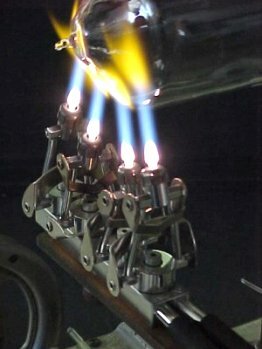 A burner is heating a custom-made repair fixture from the bottom and the glass blower will use a hand-held torch on the top. This picture shows a four jet lathe burner being used on a glassblower's lathe. A glassblower's lathe features a moveable carriage to evenly heat specific areas of the apparatus under construction or repair. 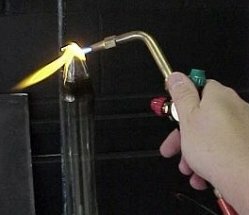 Here we see a typical hand-held glassblowers torch in action. Scientific glassblowers use this particular tool on an everyday basis. The images below are representative of the wide range of products that a research glassblower may be asked to build. Much of the work is unique in design and concept, although the occasional "test tube" is still requested. Glassblowers at research institutions do a lot of repair work as well. This intricate glass piece is a portion of an apparatus that was used by aeronautical engineers for flame study analysis. This apparatus is used for thermoconductivity research. The master crafstmanship required to make a piece of this complexity is self-evident. This is a glass cell used in chemometrics research. Glassblowers don't suffer a lot of job stress, but the pieces they create or repair sure do! This may look like a pretty picture to you, but to a scientific glassblower it is ugly! A scientific glassblower has a responsibility to the scientist using his/her glassblowing services to provide a piece of glassware that is structurally sound and built within accepted safe parameters for its intended use. All glass apparatuses must be fully annealed to relieve all stress or strain introduced into the glass during the glassblowing process. The colorful bands of light you see here (thanks to the aid of a polariscope) are indicative of stress and strain that could cause the piece to fail, possibly ruining an experiment or causing injury. These bands are the last thing a scientist would want to see in a piece of glassware used in the laboratory! There are many thousands of glass compositions commercially and custom made, each with their own specific chemical, thermal, optical and physical properties. The types of glasses found most often in the chemistry laboratory will be in the borosilicate family. The scientific glassblower may be called upon to do more than "blow" glass. It is not uncommon to work with ceramics, metals and occasionally sapphire as well. 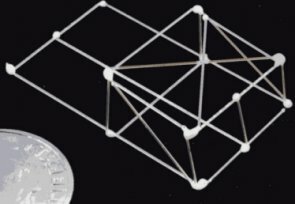 The basket to the right is made from very fine sapphire filament. The engineer conducting new materials studies required a container to hold test samples suspended in a vertical furnace with temperatures in excess of 1400°C. 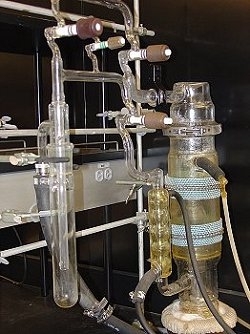 Glass apparatus used in research is not always formed by thermally heating and shaping the glass material. 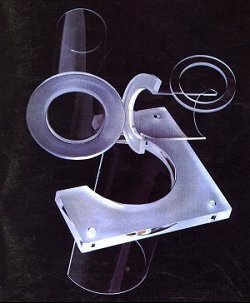 Physically changing glass form may be accomplished by mechanically shaping the glass, creating a finished product or a component of a finished apparatus. Sometimes mechanical working and thermal heating/shaping are used together. The process of cold working glass may be accomplished by using equipment designed for or modified for use in cutting or abrading glass materials. 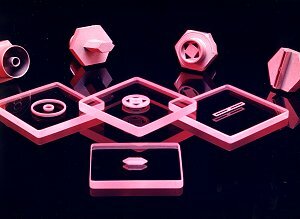 An ultrasonic milling machine was used to produce the glass pieces shown here. 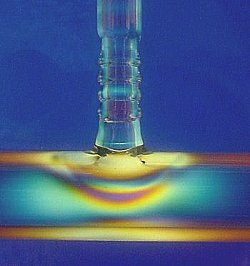 This image illustrates coldworking and thermal forming of glass to fabricate a glass part. These glass flanges were cut out of flat stock before being thermally fused to a glass tube. The finished flanges are shown here cut away for a quality control check.